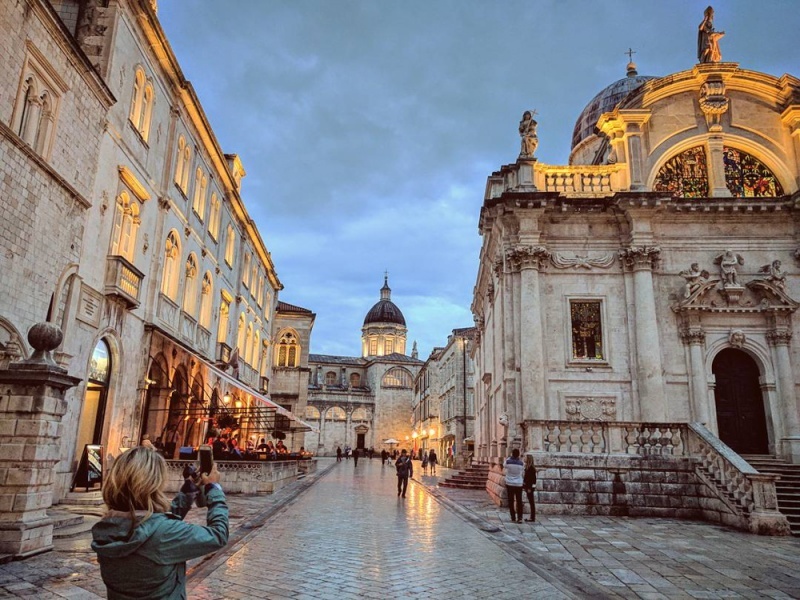 Croatia has been high on our list of countries to visit for quite a while now because we heard it hasn’t gotten all crazy touristy yet. We visited in low season (May) and the touristy areas were CRAZY packed. If this is “not touristy” and “low season”… I’d hate to see what “touristy” and “high season” looks like. To avoid the crowds in Dubrovnik but still have decent weather maybe plan on visiting Croatia in March. Most hotels require that you give them an arrival time so they can meet you. If you don’t, you’ll have to wander around trying to find wifi in order to call them which isn’t fun when you’re toting a bunch of luggage with you. Prepare accordingly. 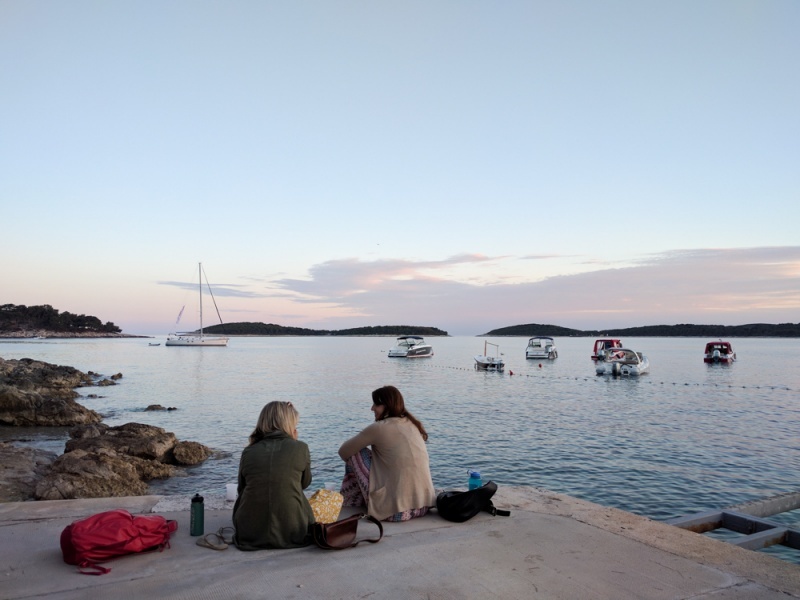 Our plan from the beginning was to start our epic European adventure in Croatia but because I’m on Nick’s sister’s Delta benefits, the best (and cheapest) option was to fly into Venice and take the ferry to Porec. Turns out we accidentally planned everything pretty perfectly since we managed to catch the first ferry of the year (on April 29th). We only stayed in Porec for a night, at a fairly centrally-located and lovely place called Rooms Valentino. One thing we didn’t realize about Croatia was that most places don’t have managers onsite so you need to prearrange your arrival time and they will meet you there. When you haven’t prearranged and you don’t have an international cellphone plan, getting into your room can be a bit hairy. So after ringing the bell a few times and wandering around, we finally found a nice gentleman to let us in (and I got to practice my newly learned Croatian greeting of “bok!” – just kidding, don’t use that, it just confuses people). We decided to have a walk around the darling little town and were drawn to the sound of live music – or specifically old school American jams – at a little spot called Beer Garden. The owner was super awesome and schooled us on how to order draft beer (the Croatian word for draft beer is “tochino!” which sounds like “don’t cha know!”), how to not offend Croatians (don’t you dare call them Serbs) and his thoughts on Donald Trump (hates him). 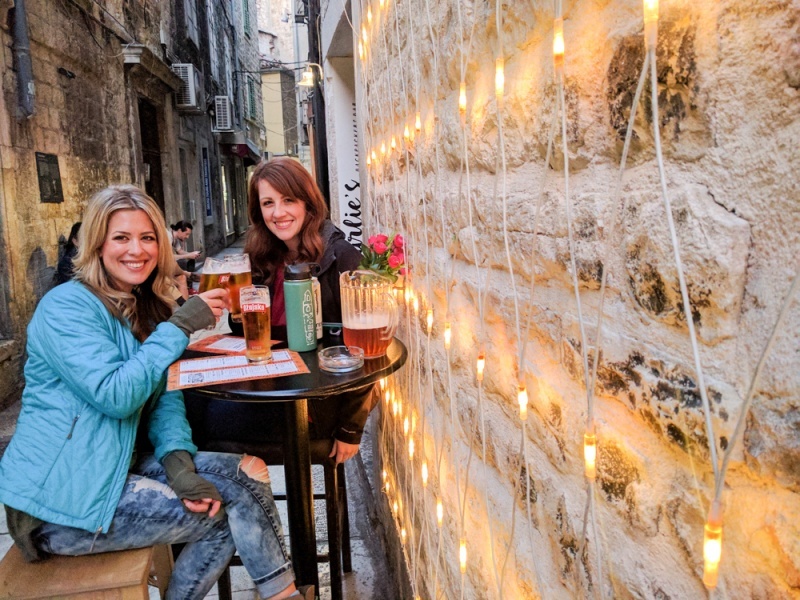 We downed a few local draft beers that cost 18 kuna (or approximately $2.50 USD) and listened to Croatians sing Elvis (adorable) before sadly calling it a night. We picked up our rental car in Porec and drove to Zagreb to pick up Nick’s sis from the airport. A few thoughts on driving in Croatia… all of the signs are in Croatian and are quite different from our American signs. You might be thinking “duh Val” but seriously, it’s pretty rough to figure out what you’re doing and what the speed limit is. I learned this the hard way after driving the wrong way down a one-way street. Also, I *think* I was going the speed limit the entire time but everyone else seemed to be going about twice as fast as me so… jury is still out. And gas is CRAZY EXPENSIVE. Like, $6/gallon expensive. So all the rentals are tiny and manual transmission so again, beware. But they drive on the right so, it could be worse. If you don’t want to deal with driving in Croatia you can hire private transfers through Octopus Transfer. Back to Zagreb… it was a Sunday so everything was pretty much closed. We wandered around the main square a bit which was pretty lovely and had some “tochinos” at one of the many outdoor cafes and then had dinner at one of the few places that we could find that was actually open called Zelendvor. They didn’t have English menus and ended up giving us a German menu which led to a hilarious ordering experience since none of us speak German and the waiters barely spoken English and definitely didn’t speak German either. After attempting to order chicken we got turkey and lamb (I think?) which was quite tasty regardless. 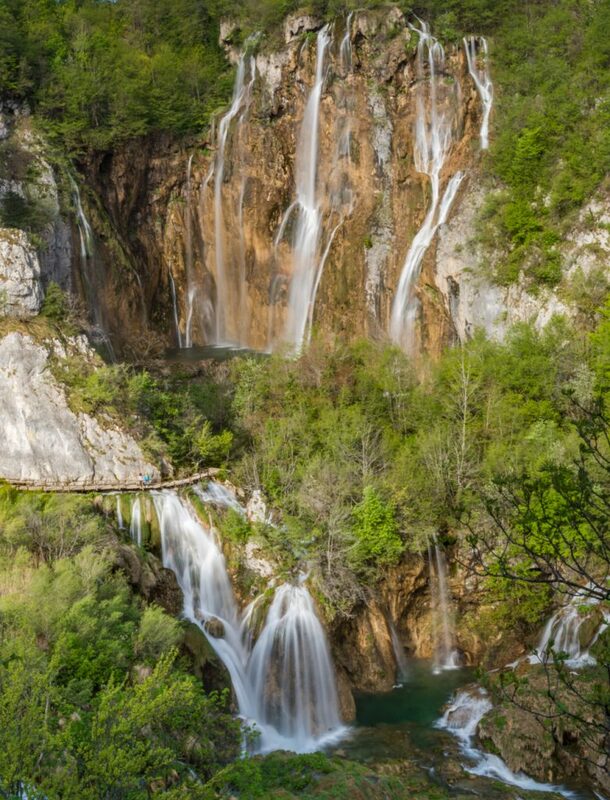 We already had a spot booked for two nights in Plitvice Lakes so we had no choice but to hit the road. 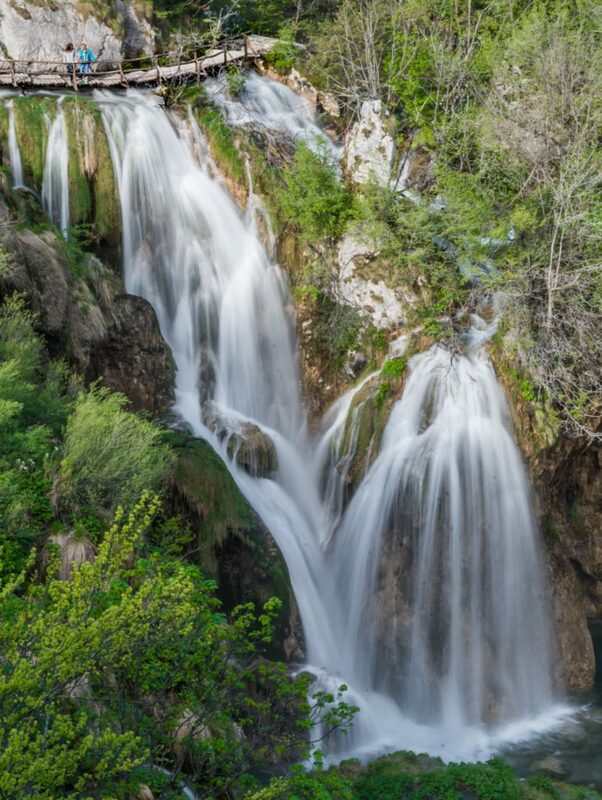 It was an easy and scenic drive from Zagreb to Plitvice Lakes. 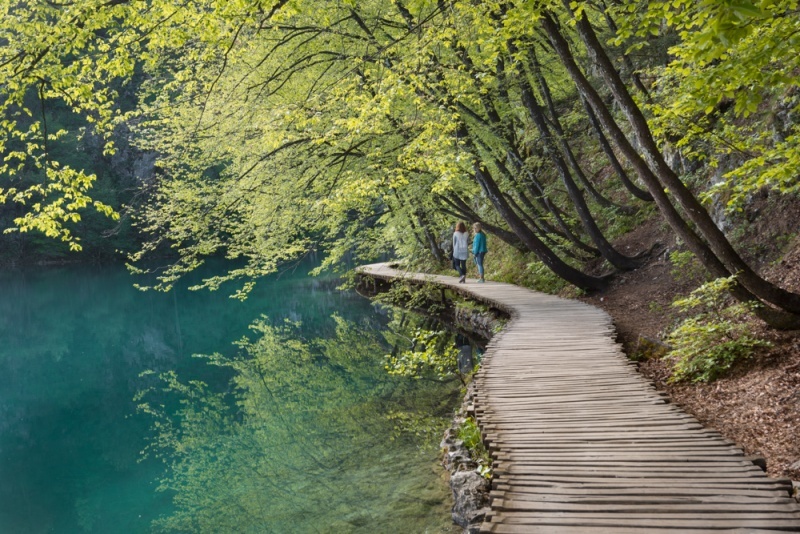 We had high high hopes for Plitvice Lakes for a few reasons; it seems to be THE “must do” thing to do in every Croatia itinerary, and it’s a national park and we LOVE national parks! So we stayed at House Marko which is a 10 minute walk from the park and we arrived to the park entrance at 8am (opening time) because we heard from our house host that there was a 45 minute wait to buy tickets the day before. There was no line first thing in the morning and we bought a 2-day pass with the idea that it was a huge park so we’d tackle half the first day and half the second. What we discovered was that the park is really lovely in the early morning before the hoards of tourists arrive and that you can really realistically explore the entire park in one day. We started at entrance one and made our way down the switchbacks to the “big waterfall” first and then up the steps on the left of the falls to an upper trail that might have been a mistake (?). Only because the trails along the water are more stunning (but also much more crowded). We hiked around for a bit, took a few photos which was difficult because it was SO CROWDED. I mean seriously, so crowded. There are walkways throughout the park that are maybe 3-4 feet wide and it was a struggle at times to get by the giant tour groups. We opted to stop for a snack and a “tochino” around 2pm which in hindsight was a bit of a mistake because it seems that the later the day gets, the more crowded the park gets. So our walk back to the park entrance was sheer torture. I made the decision that I deserved my walkway space and that I would not cower to other tourists and ended up ramming shoulders with countless parties of two that refused to unhook their hands for 2 seconds so I could pass. So annoying. The next morning we had really great intentions to get up for sunrise at the park but alas, we snoozed too long and again arrived at the park around 8am (keep in mind – there aren’t really any gates that we noticed and our tickets were only checked when we took the ferry so we assumed you could theoretically arrive to the park as early as you want without anyone taking any notice). We were able to run – literally – to get a few pics without a tour group photobombing them and then left before the park got too out of control. In hindsight, and I think I’ve said this a few times, go EARLY and for only ONE DAY and prepare yourself for chaos. And then try your best to be patient and happy and enjoy the awesome beauty that surrounds you. 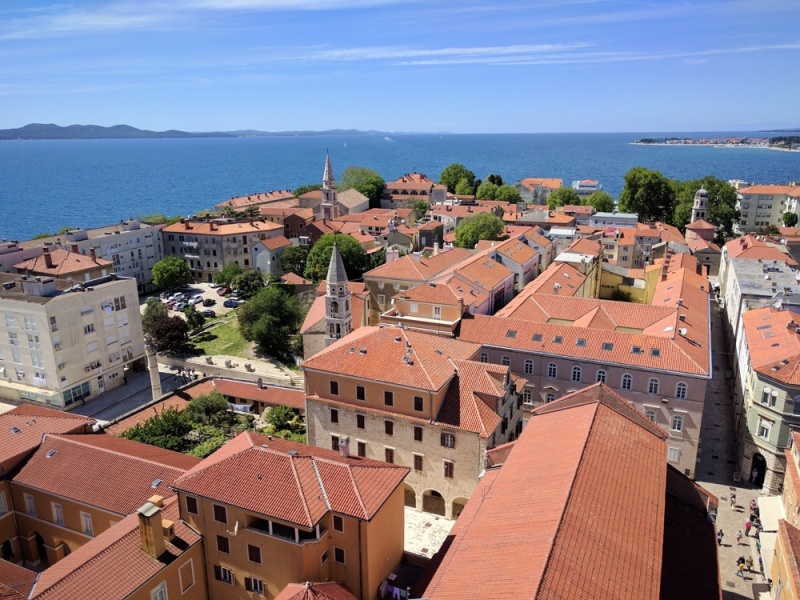 We made a rather last-minute decision to stop in Zadar after Nick’s sister read that the only “sea organ” in the entire world resides there. We stayed only one night at Apartments Petra which is run by the nicest lady in the entire world who fed us loads of homemade cherry liquor shots. We had a nice walk about town to check out the old walls and gates (just like you’ll see in every other Croatian city) and then over to the boardwalk to check out the “most beautiful sunset in the world” according to Alfred Hitchcock, while listening to the one-and-only sea organ and viewing the Sun Salutation Light Show Art Installation (which wasn’t as cool as we thought). We figured we could find better food for less money outside of the old city so after a quick TripAdvisor search we landed on Mamma Mia which turned out to be fantastic! Our lovely hotel mum recommended that we take the scenic coastal route to Split which she said would take a bit longer but was far more beautiful than the freeway. And while we aren’t exactly sure what the views are from the freeway, the coastal route became our favorite part of the trip up to that date. 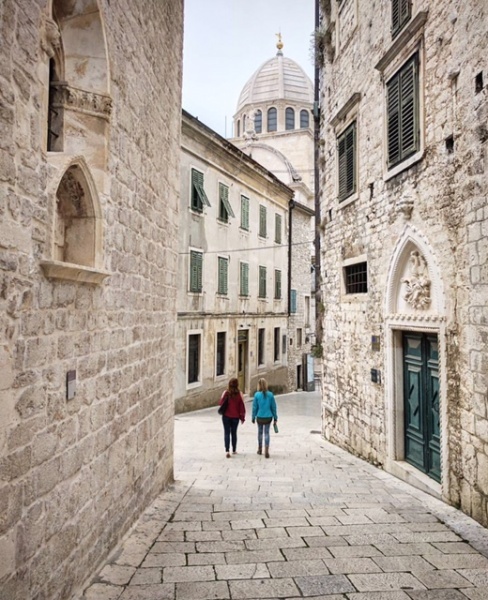 We stopped in Sibenik and Primosten for a quick walkabout – both are lovely little towns with lovely buildings. In hindsight I think spending a night in Primosten would probably be pretty amazing and neither of those towns seemed particularly touristy. Most people we talked to said that Split was a good jumping off place to head to Hvar but not a place that they would recommend spending a lot of time. 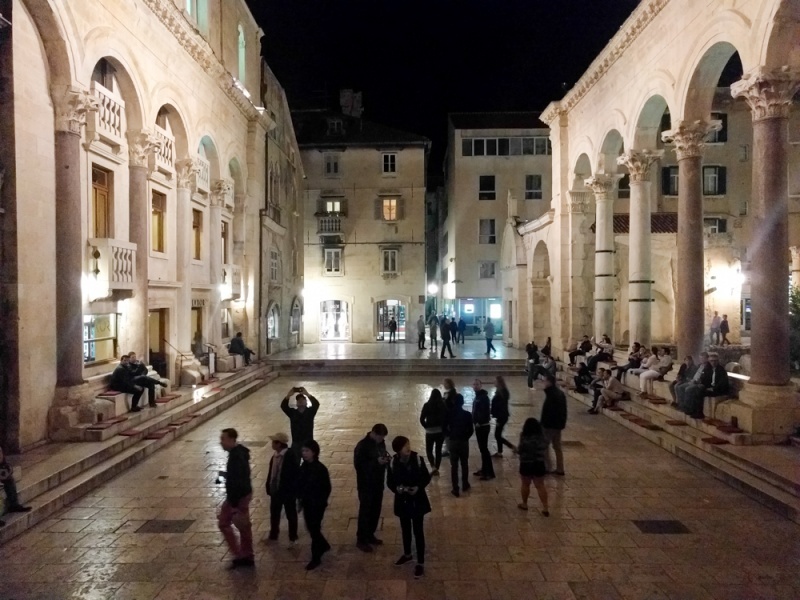 We felt quite differently – we absolutely LOVED the city and felt like 24 hours in Split wasn’t nearly enough. Our room in the Apartments Korta was lovely but it was also down the skinniest 2-way street I’ve ever driven on (in case you’ve rented a car – beware!). We had cheap pitchers of “tochino” while we waited to eat at a darling but tiny restaurant called Villa Spiza. Then we wandered around the giant maze of alleyways and listened to live music in the square (insiders tip – you can pay an outrageous price to drink the beer from the restaurant and sit on a cushion OR you can buy your own beer at the store and sit on your bum and listen for free). The next day we were up early to buy our ferry tickets to Hvar for 2pm and we did a bit more wandering through the endless open air markets where I was called a “miss piggy” (an issue with the translation I hope?) before boarding our packed and hectic 1.5 hour ferry to Hvar. Hopefully on our next trip to Split we can spend a bit more time enjoying the city and exploring the nearby islands! 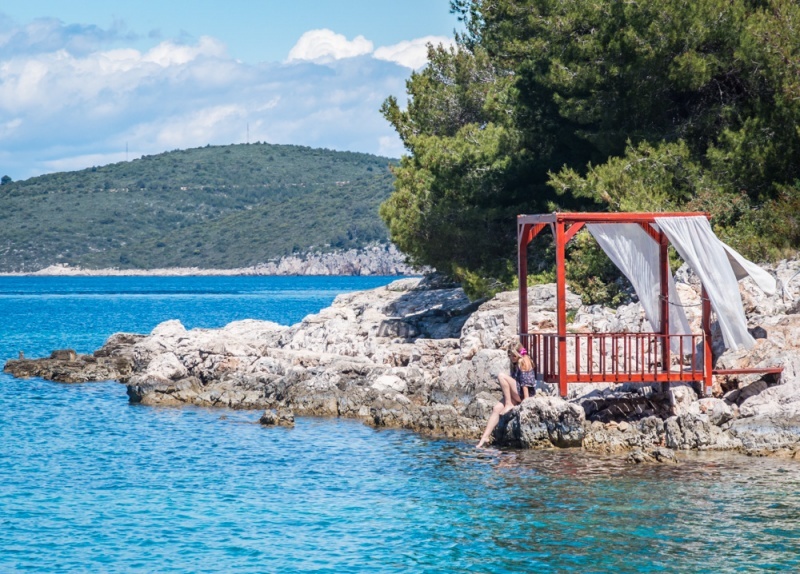 From the moment I stepped off the ferry in Hvar it was love at first sight… crystal clear water, a bustling but not too bustling main square, delicious-looking outdoor restaurants, quaint colorful boats… you get the drift. It’s pretty much paradise. Our Pataks Place Hotel host picked us up at the bus station near the square and in hindsight it was pretty clutch that we didn’t have to haul our bags all the way to the house which was close, but not THAT close to the main square. The first night we had dinner at Fig Cafe Bar where we met Jeff (or is it Geoff?) who owned a hostel nearby and drank beers while chatting with us and offering us free appetizers (aka my dream job). We asked him about hiring a boat and he said he had a friend, Bojan at HvarBoats that would rent us a 5 horsepower boat for the bargain price of 400 kuna (~$60 USD) for the day, including gas. Seemed like a steal to us so we hit the market for some snacks and plenty of wine and prepared for our epic sea adventure the following day. Well, the day started out with rain. So much rain. So instead of starting at 8:30am as planned, we headed to the dock (about a 30 minute walk from our apartment) at around 10:30am. We paid cash – no need to show a passport or a credit card (in case you are trying to steal a boat, seems like this would be an easy target), got a quick lesson in driving and parking the boat, and were off! They gave us a hand-drawn map and some loosey-goosey instructions on where to find beaches and we (very, very slowly) explored the islands near Hvar. In hindsight, even though our tiny boat would have never in a million years made it to Vis and the Blue Cave (the prize jewel of the area), this was the most fun for the best price that you can have on Hvar. We found an awesome secluded beach, blew up the new double-heart floaty, broke out the rose and the new drone, and had our own epic Mediterranean boat party. Our own piece of paradise! 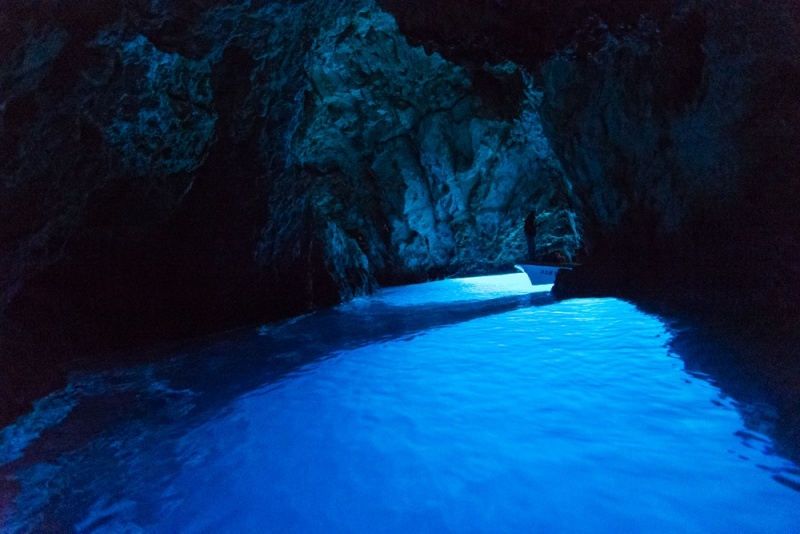 Unfortunately, we had a severe case of FOMO (“fear of missing out”) and were soooo super concerned that if we didn’t see the Blue Cave we would forever regret our choice. So we talked to our boat guys about options for tours and they gave us two options; hire a private boat for 2400 kuna including fuel (~$360 USD) to get a big boat and a skipper and tool around just the 3 of us wherever our hearts desired. OR go on a tour which would be 450 kuna per person (~$70 USD) and we would do on a predetermined route with 6-13 people on one boat. We couldn’t justify the cost and opted for the tour. They packed 11 people on our tiny boat which felt smushed. The tour started at 10:30am; we started with the “green cave” which wasn’t particularly green, then the “blue cave” which was actually awesome. It’s a national park so it was an additional 50 kuna per person (~$7.50 USD) and they move you to a smaller boat and drive you through a tiny opening in the rock where you have to duck your head and if there are big waves it’s particularly persnickity (our boat driver literally fell on me). But it’s legitimately BLUE. We spent maybe 5 minutes in the cave (no swimming allowed) before we headed back to our tour boat. We made several more stops – to random caves that weren’t that cool and the “tiniest beach on Vis” where we could take pictures and another strange beach for pictures and FINALLY around 2:30pm our skipper dropped us on a beach where we got 2 hours of lounging time. This was actually a beach that we passed the day before on our solo adventure but chose not to stop because it looked so crowded. Our last day was spent hiking up to the fort for some sweet city views and then lounging around until our last glorious meal in Hvar – at Konoba Menego which boasts “no pizza, no pasta, no Coco-cola” before tucking ourselves into bed to get ready for our early ferry. 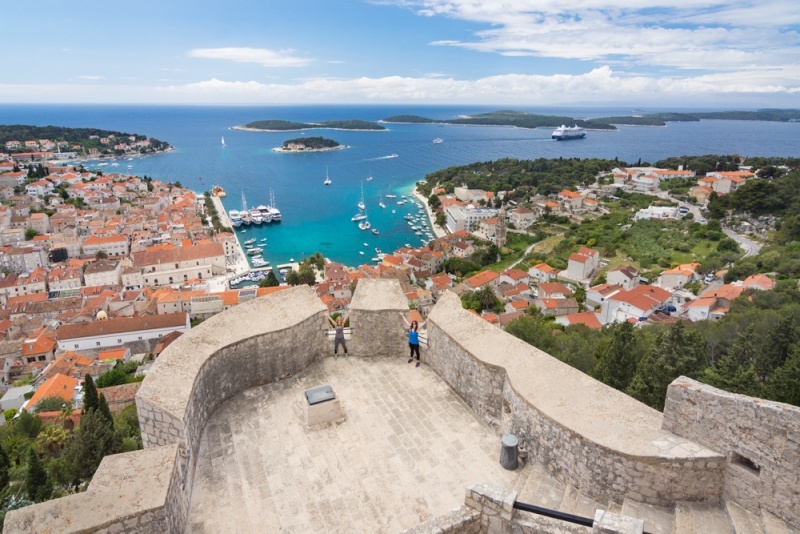 Our original plan was to take a ferry from Hvar to Dubrovnik on Sunday so Courtney would have a few days to check out the city. Turns out the ferry doesn’t run on Sundays (at least in low season) and the thought of catching a ferry back to Split and then a 4-hour bus to Dubrovnik did not sound appealing so we ended up waiting for the 8:50am Monday ferry. The ferry was actually quite comfortable and only took about 3 hours. From the dock we took a 70 kuna taxi to old town to find our apartment. 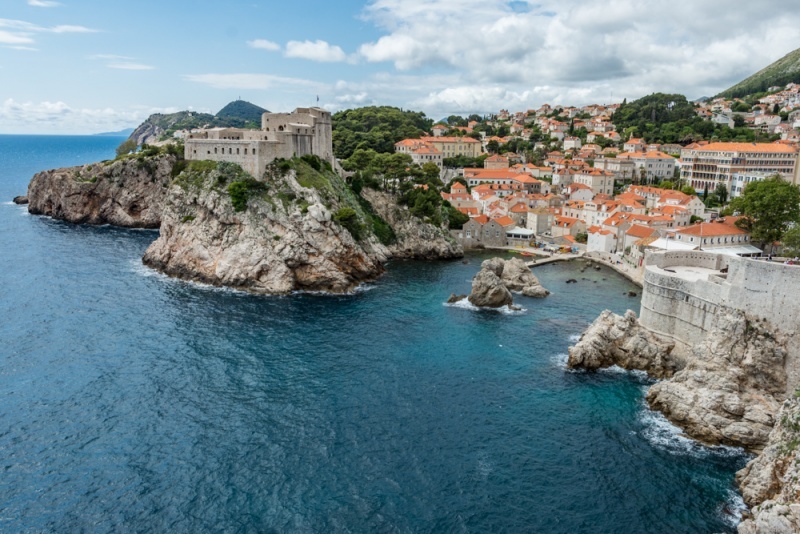 Dubrovnik has become incredibly popular with touristy recently; mainly due to the fact that it serves as Kings Landing in the television series A Game of Thrones. 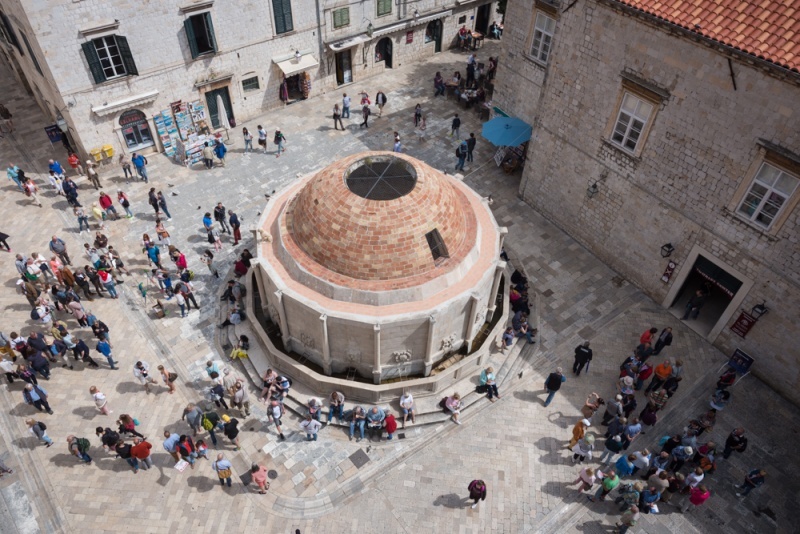 Everywhere you go in Dubrovnik you’ll find people on Game of Thrones tours. We didn’t end up joining one because even though we have read the books we have never actually seen the show so it seems the many references would be lost on us. 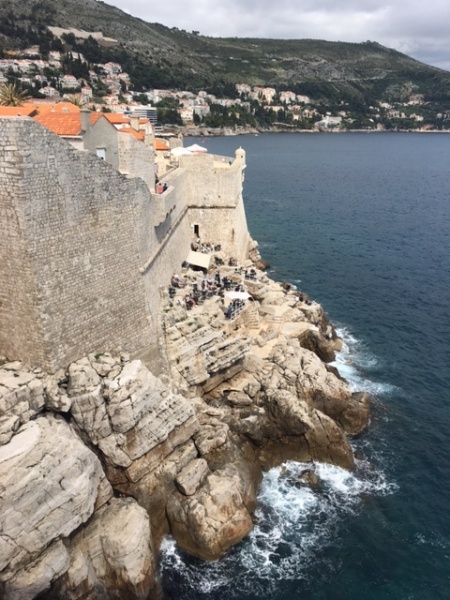 We headed out shortly after to track down the cheapest gelato (10 kuna) and then have a walk around the Dubrovnik city walls (150 kuna). The wall is 2 kilometers long and can be walked completely – we stopped for pictures every few minutes so it ended up taking us about 3 hours to complete the journey. The views of the sea and of the old buildings with matching orange tiled roofs were spectacular. There are little cafes, gift shops, and bathrooms along the way so you could really make a full day out of it. 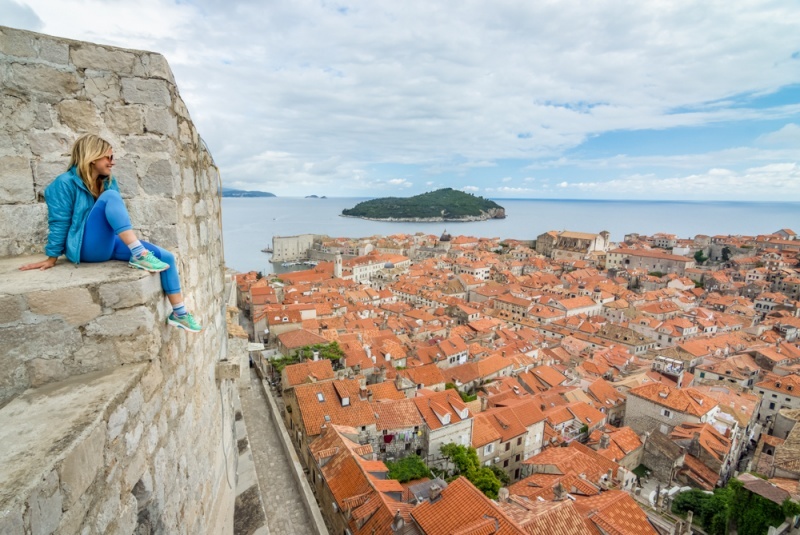 Walking the old walls is definitely the one activity you can’t miss in Dubrovnik. Your ticket to the city wall walk also covers the entrance to the fort across the way (it’s normally 50 kuna) so we headed over there next for more stairs and views. 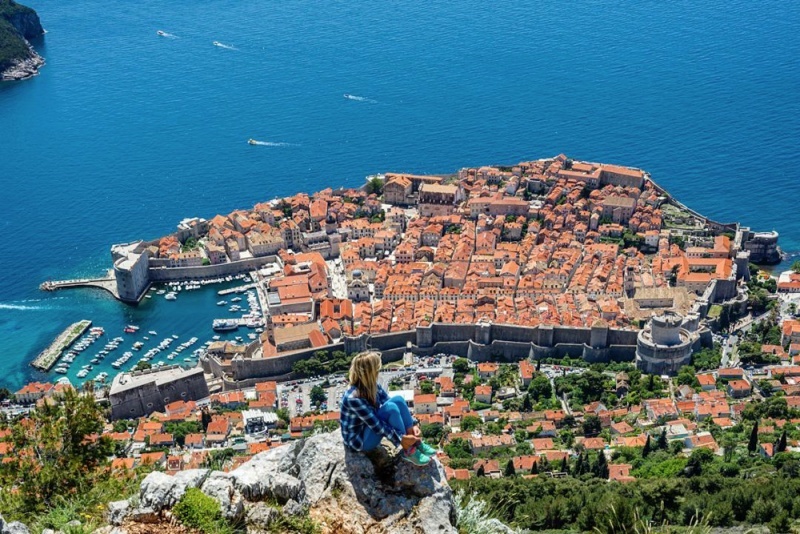 We overheard a bunch of Game of Thrones tours going on which seems to be the thing to do in Dubrovnik. We spotted an awesome looking bar on the water from the wall so we decided to stop for a quick tochino before dinner. It’s called Cafe Buza and it’s super popular (and a bit pricey). So we climbed down closer to the water, sat on a rock, and pulled a bottle of wine out of our bag (handy). There were a few others down there drinking their own store-bought beers so it seems the restaurant is cool sharing space. It would be a fantastic place to chill out and watch sunset on a budget. Our second full day in Dubrovnik was spent doing some much needed laundry at a quaint (but expensive) little spot right outside of the old city call Laundry Spin. It was 50 kuna for a wash and 10 kuna for 10 minutes of dry time and probably all in cost us $12 or so to wash pretty much everything we own. While we were laundering we were also attempting to check into our new apartment (we switched to a 2-person room because Courtney left that morning). 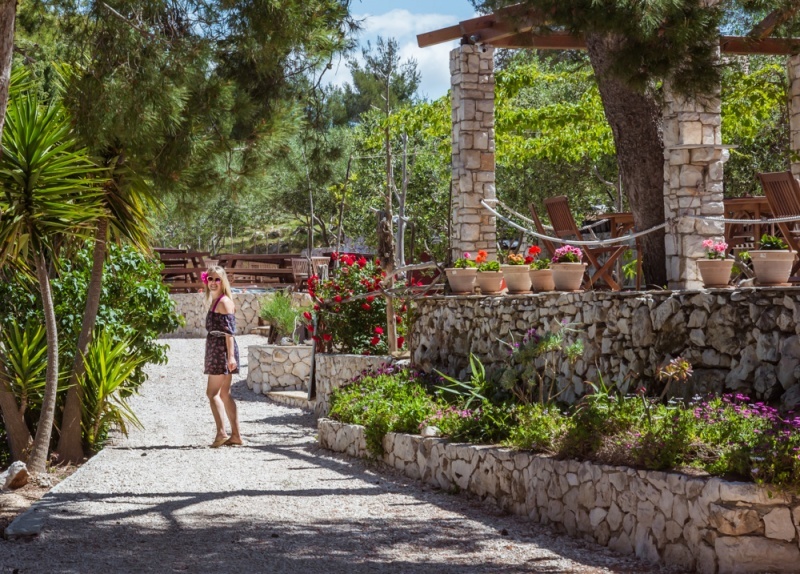 In Croatia, and maybe all of Europe, when you book a room there are rarely hotel staff onsite. So you need to tell them your arrival time in advance, otherwise you’ll be sitting outside of a locked door waiting for eternity. We messaged our new spot, Apartments and Rooms Verdi, and asked if we could check in at 11:30am. They wrote back saying that no, check-in time is from 2pm-10pm. So we sent several messages saying “okay, how about 2pm?”… no response. “Hey apartment people, what time can we check in?” Nothing. And so on. Finally, after hours with no response, at around 3:00pm we decided to walk over and see if someone could help us. We knocked, rang the bell, stood around… and finally found a helpful neighbor to call our apartment manager. He finally showed up after we’d been waiting for about 30 minutes. He was apologetic and blamed it on the property management company which we understood. But the room was tiny so, would we stay there again? Doubtful. Also it was around the same price that we’d just paid for our 2 bedroom with a kitchen Airbnb spot that was much more spacious and also quite conveniently located. We grabbed dinner in our little alleyway which seemed to be restaurant row. All seemed overpriced by Croatian standards (expect to pay $12-25 per entree). But then again, all of Dubrovnik seems pretty pricey. Nick judges the price of a city by how much a draft beer costs and Dubrovnik was 25 kuna (~$3.50) versus the 18 kuna it cost in Porec and other smaller Croatian cities. 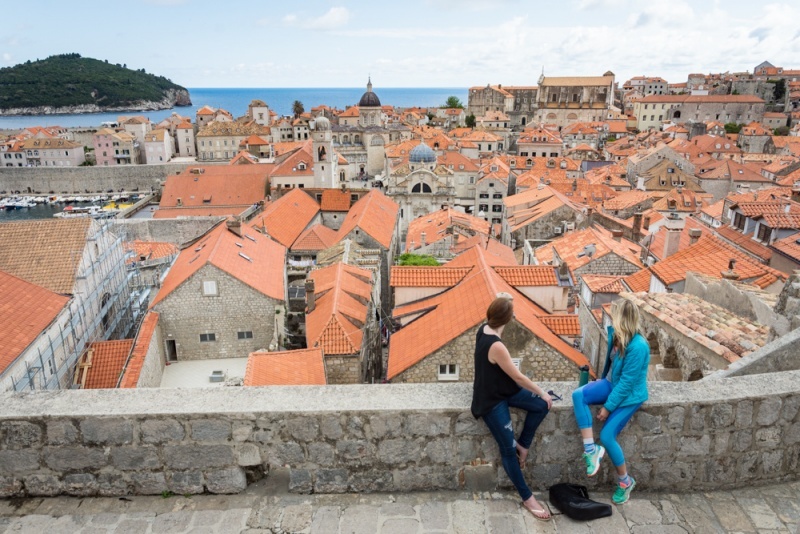 Our 4th full day in Dubrovnik (FYI… 4 days is probably more time than one needs in Dubrovnik) was spent getting up early in order to take a few pictures in the old city without a million other photobombing tourists. Then to the cable car for amazing views of the city. Although in hindsight, it was probably not something I’d choose to do again… it was 80 kuna for a one-way ticket (we planned to hike back down) and it was CRAZY at the top. We found a rocky area under one of the viewing platforms where other people were hanging out and taking pictures so we joined them. Then around 3pm we decided to take the 15 minute ferry out to the island of Lokrum where peacocks and bunnies roam free and there is a nudie beach and a scary old monastery and you can just wander around without anyone bothering you. We had a lovely few hours there and then caught the last ferry of the day, at 6pm, back to the mainland. We met our friends from the states at Otto Taverna outside of the old city (sooooo pricey but delicious) and then called it a night since we had a 3-hour bus ride to Mostar in Bosnia and Herzogovina to catch the next day. To sum up our 12-day Croatian experience… Croatia seems to be everything you think it will be… lovely old cities that are rich in history; wonderful and helpful people; a place where you feel safe and generally welcome; fantastic cuisine; generally reasonable prices in most cities; and most people speak English so it is easy enough to communicate and to get around. 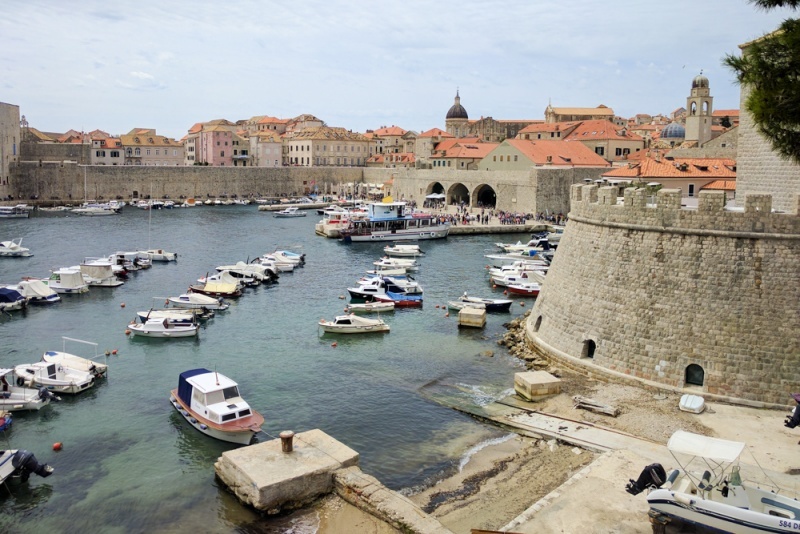 BUT I mentioned at the beginning of this post that my draw to Croatia was because I assumed it hadn’t gotten all crazy touristy yet, and that is most definitely not the case. 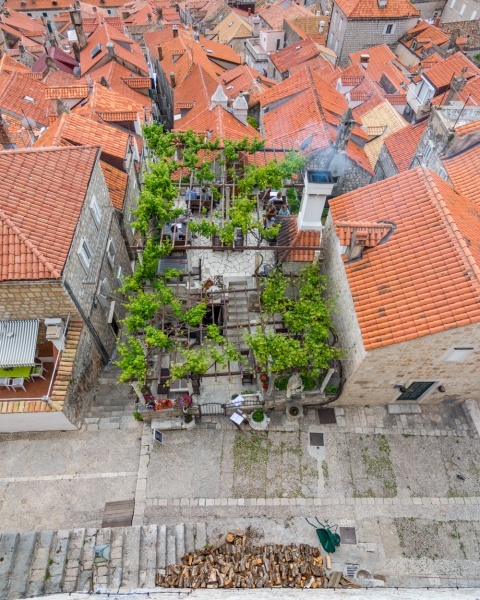 Looking for more details on what to see and do in Croatia? 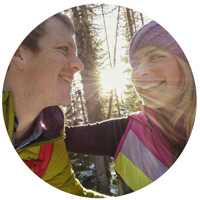 Check out our favorite books! Love this, insanely helpful as I start planning my birthday trip over there (in September… eek high season)! Thanks for the insight!